KJ Charles is starting anew trilogy of queer romance, a sort of spin-off of The Casebook of Simon Feximal, set in 1920s. Sounds pretty awesome, right! 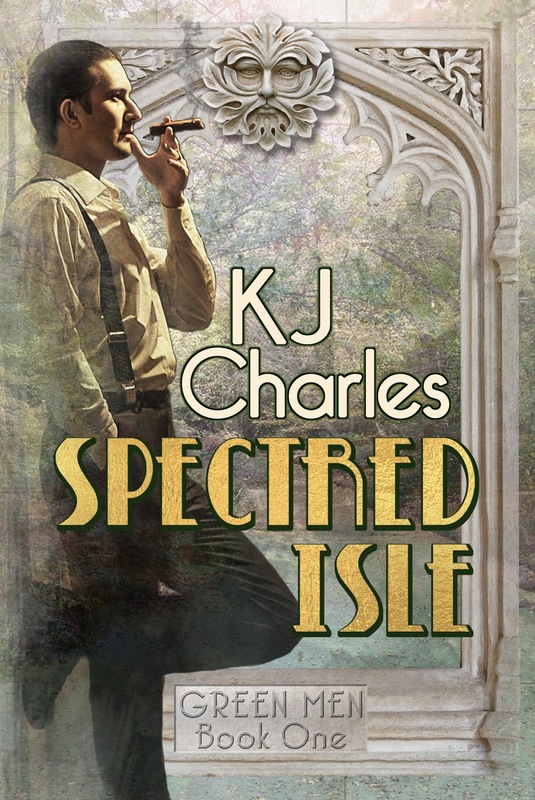 The first book, Spectred Isle, is out on August 3 both as ebook and in print. Read on for more information on it. You can also enjoy an exclusive excerpt from the book at the end of this post. Happy reading! If my theory is correct, there will be a site on the west side of Oak Hill Park, Major Peabody had said. A burial, a standing stone, a sacred grove. A historical artefact or a local legend. Explore for me and see what your professional instincts can discover. Saul’s professional instincts were shaped by his doctorate in archaeology from Oxford and two years working on excavations in Mesopotamia. Major Peabody believed that if the ravens left the Tower of London, the city would fall. It was not a match made in heaven, but Saul gave the Major the best work he could and strove to be respectful without losing what little self-esteem he still had. There was no sign of any sacred Druidic grove or whatever bee was in the Major’s bonnet this time, but there was a truly magnificent oak dominating the landscape not far ahead. Saul took another step towards it, admiring the gnarled branches and the bright light green of its fresh new foliage, and it burst into flame. The fire erupted so violently that Saul heard a faint whoomph of air, like an explosion, and his immediate war-trained thought was, Mortar. He could see all around the heath, though, and there was no engine of war, no gun, no people, even, except for one man some way down the path who was running towards the tree with such urgency that Saul found himself jog-trotting, then sprinting, to meet him. By the time Saul reached the tree, it was blazing so hard he couldn’t go near it, waves of heat rolling out and stinging his eyes. The other man was standing, breathing rather less heavily than Saul, staring at the conflagration. “What the devil happened?” he demanded aloud, in a decidedly upper-class tone. “Unnatural,” the man completed. He was regarding the tree with hard, sceptical eyes. Saul couldn’t blame him. The tree had been a living thing; if you’d chopped it down the wood would have taken a good year to dry out for burning, but the fire was so fierce he felt it heating his cheeks, and so loud that they were almost shouting over the noise of branches crackling and snapping. How in God’s name did a live tree burn like that? Saul had trained himself to endure contempt, but he didn’t have to take sarcasm from a stranger. He turned away from the inferno and had his first good look at the other man. He was of medium height, but thinnish and rangy, which made him appear taller: the sinew and whipcord build that Saul himself had, and liked. English from his features, with dark hair and much lighter hazel eyes under near-black, slanted brows. A saturnine, sardonic sort of face, clean-shaven; a mouth that seemed made to sneer. He looked like the kind of man Saul had met a great deal in the war in the officer ranks: a thoroughbred aristocrat, effortlessly superior, endlessly disdainful. “See anything you like?” the man enquired, those finely shaped lips twisting, and Saul realised he’d been staring. Well, sod you, fellow. “I can’t say I do, no,” he replied affably, and wasn’t sure if the flicker in the man’s expression was amusement or affront.